Spring Break! A chance to escape selection committees and program reviews, and this time my destination–the Blackwater Creek. 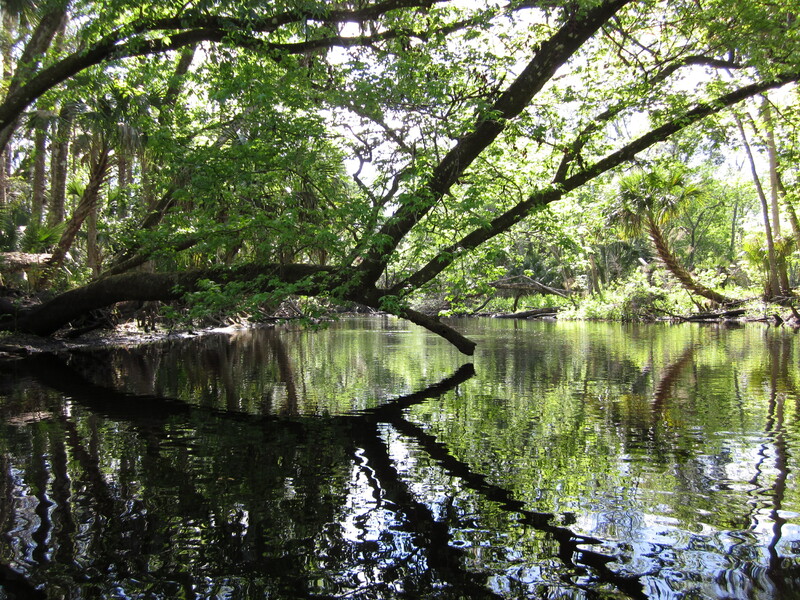 The Blackwater Creek, a sweet, tea-stained river, originates with the waters of Lake Norris in Central Florida. Carter et al. describe its 20-miles of twists and turns through the cypress forest as “tight and hauntingly beautiful.” As it weaves its way through the forest, the Blackwater Creek eventually empties into the Wekiva River which then joins with the St. Johns River. I could not have had a better guide for the day than Bill Belleville, Florida writer, filmmaker, and nature lover. We began our journey by putting in at the bridge in the Seminole State Forest. We paddled several miles downstream and returned nearly five hours later along the same path. We never passed another soul on the river. As we paddled, the creek seemed to embrace us like an old country road, twisting and turning and surrounded by beautiful flora—and just a few critters. Live oaks, sweet gums, cypress, and cabbage palms framed our liquid pathway. Alligators—some as big as 10 feet long—slithered into the water as we approached. Anhingas sat on branches, drying their wings, and we spotted wood ducks, herons, and even a red-shouldered owl. The creek varied, first narrow, then wide, then narrow again. The water was cool and clear enough that, at times, I could see the bottom, and then it deepened and darkened. The low banks showed wear from water level changes and the hurricanes from years ago. The forest surrounding us was dense, then sparse, the sparseness a reminder of cypress logging in the early 1900s. The creek challenged us, only a bit at times, with downed trees and logs. The waters moved us along at a nice, easy pace. We had originally planned to paddle to the Wekiva, but Bill had heard that the creek was blocked and impassable further down, and so, we decided on this loop. For us, it was a beautiful, serene day on the Blackwater Creek under the lovely Florida sun. In the time that we lived in Orlando, I never made it to this body of water. It’s seclusion is inviting and tantalizing. I believe you would love it.� I understand the section beginning at Lake Norris is also very serene and beautiful. Hi Susan- Great job on the description of our Blackwater outing ! Not over or under-done, but right on the mark. Glad you enjoyed it. Finally have a few spare moments and will also post my images from that superb day. Ironically a film crew from CA is traveling here on contract for a conservation foundation, and called about doing some stuff with me on camera out there tomorrow afternoon. What great news on the film crew! I hope the weather is as gorgeous as when we were there. You’ll have to fill me in. We used to ski on Black Creek when I was a teenager. I wonder if it’s the same as Blackwater Creek? Sounds lovely!